Mrs Gippsland Food Adventure has been reminding me it’s been sometime since I’ve written a blog! But it’s not like I haven’t been busy???? Over the last few months we’ve had lots of new lambs and calves to look after, haymaking, shearing, weeds to control, new fencing projects, stock to sell etc. During early November there were drought management strategies developed……….and then shredded once the beautiful late spring and summer rains fell. We also had the pleasure of hosting some Food Adventures with a few professional groups, overseas visitors as well as new friends celebrating birthdays and great Gippsland food. But in the shadows of Australia Day celebrations – hopefully with a lamb chop BBQ – it would be "unaustralian" for this sheep producer not to write a few words! And front of mind is the wool clip we sold last week – 66 bales from around 2200 sheep. Wool sales used to be a major item on the social calendars for farmers – a trip to town, wearing a sports coat and tie – to be wined and dined by the wool brokers (sometimes for a day or two!). But in these days of tighter profit margins, few people have the time for such frivolities. Shearing is a 6-8 day activity - one of the (many) jobs we try to get done by that self-imposed Christmas deadline. But due to delays in shearers getting started or wet weather, it often runs past this date. There’s a real buzz around the farm over shearing – long days mustering sheep up to the shed and returning them to their paddocks at the end. The constant hum of the shearing plants provide the background for our yard work – drafting, drenching and branding shorn sheep. The real work continues inside the shed, strictly adhering to the shearers’ hours established decades ago. Start time for the 4 two hour shifts (or runs) is always 7.30, with mandatory half hour smoko break in the morning and afternoon and 1 hour lunch from 12.00 – 1.00. There’s lots of tradition and history inside the shed. Our three shearers set the pace for everyone to follow, and it’s a true team environment. The three shed hands have their given jobs – penning sheep, sweeping the board, skirting the fleeces, pressing the wool into bales – but all are on the look out to help each other if someone gets behind. And it’s very hard work – on the hot days the galvanised iron shed really heats up, so the water bottles and fans are close at hand. An unusual challenge our shearers faced last year was a 1 metre tiger snake that slithered along the floor! The biggest of our shearers called Moby, stricken with fear, called to our shedhand for assistance, but she had already escaped to the furthest corner of the shed – so much for team work! 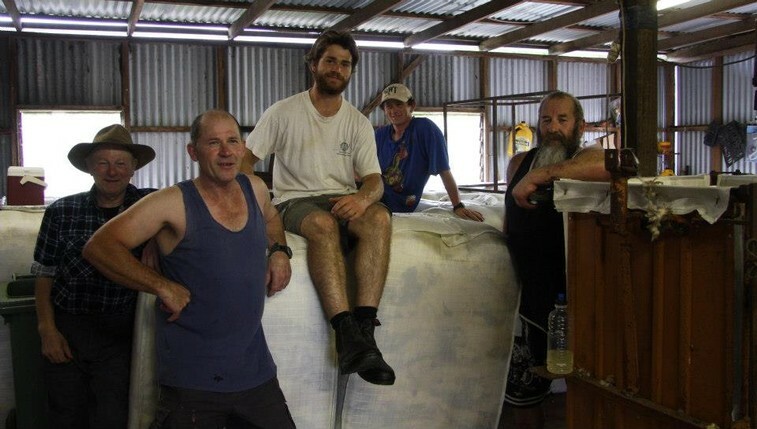 When shearing is finished, tradition has it that the farmer organises drinks for the shearers’ "cut-out". It is a time to share stories, jokes and racing tips, and generally celebrate a job well done, but today’s drink driving rules means the big cut out parties are a thing of the past. However, unlike most years when our shearing shed lies dormant, the real action is about to occur. We’re getting very excited about our "Lamb – paddock to plate experience" as part of the Melbourne Food and Wine Festival in March, and the shearing shed will be front and centre of the action. The character and aromas of the shed will provide the backdrop to an informative and fun adventure including a lamb carcase cutting demonstration and lamb dinner.